Fraaie, PRO-Slayer sleeves, geschikt voor standaard kaarten (66x91 mm). Elke box bevat 100 stuks. Verwacht maart 2014. Ultra•PRO is launching a new brand of Deck Protector® sleeves in the coming months, PRO Slayer™. We’d like to share more information with you about our new sleeves, why we’re producing them, and the specific merits of the new sleeves that will help you to get these out in to the market. Our Goal: To provide a high-quality, US Made, solid color sleeve with a smooth finish. • Made in the USA. Our Manufacturing Operations team is proud to bring this product back domestically with the goal of increasing the performance quality of our new sleeve line. • 100 Sleeves per box. Based on consumer input, we will be offering PRO Slayers as a 100 count box. Our Quality Assurance and Production teams will ensure that no pack is ever less than 100 sleeves. • Strong Consistent Seals. Between our proprietary materials and the quality control at our facility during production, we will lead the industry in providing strong consistent seals. • Evenly cut sleeves. Our quality team here in the US will ensure, through personnel expertise, product testing, and superior manufacturing, the highest quality, most consistent product available - from sleeve to sleeve and pack to pack. • Consumer appeal. The original Ultra•PRO Deck Protector® sleeves were sold in cardboard boxes that would double as a limited-use Deck Box. The new packaging, a clear plastic printed box, is a modern version of our original product, which will have excellent shelf appeal and will again double as a limited-use Deck Box. • Smooth, un-textured, solid color material. Our proprietary formulas for each of the colors will have a soft, smooth feel. 5 of the 6 initial launch colors are 100% opaque, with the Hot Pink color being about 90% Opaque. • Smooth, clear front. PRO Slayers will use the same clear material as our standard Solid Color Deck Protector® sleeves. 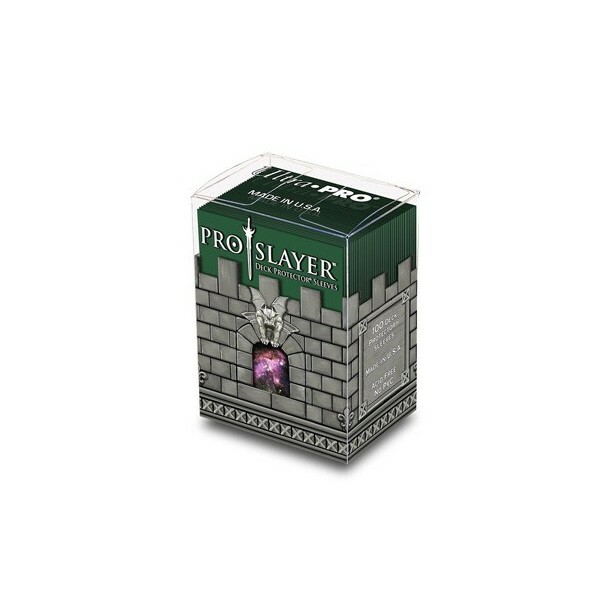 PRO Slayer™ Deck Protector® sleeves will also include the Ultra•PRO Hologram. We feel that these are the most pertinent selling points for the new line. Our marketing efforts will focus on getting this information in to the hands of consumers through on-line product reviews and printed Ads, as well as our social media pages. We’re excited to launch our PRO Slayer™ Deck Protector® sleeves and they are a product that we expect to dominate the market for years to come.